On the heels of a historic election and after the signing of a new international agreement on climate change in late 2015, many observers in Canada are asking where is the public on climate change and how much further do we need to go? According to a new scientific model, we find that nationally, 79% of Canadians believe Earth is getting warmer, but that there are also distinct differences across Canadian provinces and electoral districts (also called ridings). These regional and local differences are of crucial importance, not just for implementing new climate policies, but also for local level planning, public engagement, and outreach. To help policy-makers, NGOs , businesses and other community stakeholders better understand these differences, we recently released a new interactive tool that visualizes the geographic distribution of climate change opinions across Canada. The tool is based on a statistical model that combines over 5,000 responses to national surveys (from 2011-2015) with demographic and geographic data. The tool, developed by researchers from the Université de Montréal, University of California Santa Barbara, Utah State University, Yale University and the University of Essex, allows users to download the underlying estimates of public opinion for each province and riding in the country. This new tool, presented in the form of maps, is available <here> in English and <here> in French. Results from the tool reveal for the first time, in great detail, the geographic distribution of climate opinions across the country. But what’s most remarkable is the consistency: we estimate that a majority of Canadians in every federal electoral district think that earth is getting warmer. Estimates for this particular climate belief range from a low of 56% in the Saskatchewan riding of Souris-Moose Mountain to a high of 91% in the riding of Halifax, Nova Scotia. Still, we find interesting regional differences. There is higher belief in climate change on the coasts, and in urban parts of the country, than elsewhere. Despite this high level of awareness, not all Canadians attribute warming to human activity. We find that 61% of Canadians believe that humans mostly or partially contribute to a warming planet. This understanding of the human cause is similar to what’s found in the United States. Public understanding of climate change science also varies significantly across regions and districts, as can be found by exploring our maps. For instance, urban dwellers living in Edmonton and Calgary, Alberta—a province with major oil sands extraction activity—have climate attitudes that are more similar to those among people living in parts of urban Toronto, Ontario than among residents in more rural parts of their own province. We also found majority support for an emissions trading scheme in every Canadian riding. A carbon tax garners less popular support nationally, but there are still more people who support a carbon tax than oppose it. We find plurality support for a carbon tax in more than half of Canadian ridings, and majority support in 44% percent of ridings. 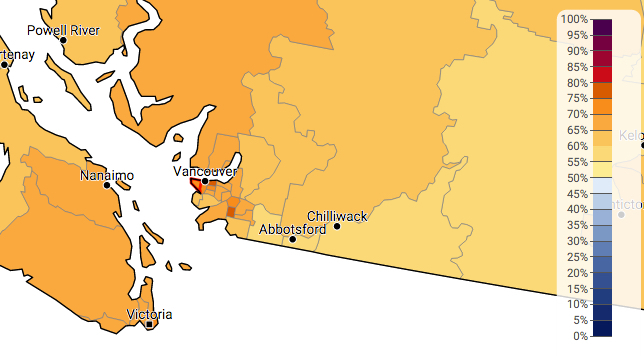 You can explore the maps and data by going to our website, choosing a question and clicking on a province or district. The Canadian Climate Opinion Maps (CCOM) were created using a statistical model based on over 5,000 responses to national surveys conducted in Canada from 2011 to 2015. We use a geographic and statistical model validated in the United States to estimate this opinions called multi-level regression with post-stratification. Users should keep in mind the accuracy of the estimates are approximately ±6 percentage points for the provincial-level estimates and ±7 percentage points for the district-level estimates at a 95% level of confidence. Mildenberger, Matto, Peter D. Howe, Erick Lachapelle, Leah C. Stokes, Jennifer R. Marlon and Timothy Gravelle (2016) “The Distribution of Climate and Energy Opinions in Canada,” at the Social Science Research Network.